Here are my remarks from today’s ceremony …. I consider it a real honor to be able to speak at this dedication ceremony today and to be with you on such an important occasion. My name is Donald Jarvis, I am a combat veteran; also from Newbury with deployments in Iraq and Afghanistan. I work for the Massachusetts Department of Veterans Services and it is with great honor today to be here in Newbury honoring a fellow veteran and resident Donald Wilkinson. Today we remember the sacrifices he made, and the courage it took to defend duty, God, country and the United States Marine Corp.
As we look at this bridge today we see many different textures; including granite, steel, concrete and grass. Each of these textures offers its own particular component to this memorial. Granite with its unyielding firmness and endurance. The steel with its strength and determination. Reinforced concrete with its ruggedness and the grass that adds a softness that tends to surround the power generating from this bridge. Now, these characteristics can also be said of a United States Marine. An unyielding firmness and endurance to the end of their mission. A ruggedness to finish the mission assigned. But, along with all this goes softness, like this grass, to realize that there are moments that command a sympathy and sensitivity to a brother or sister who may need support when the battle becomes overwhelming. Today, it is only fitting that we dedicated this bridge to Sgt Donald Wilkinson. Who, while on his 2nd tour of duty in Vietnam he was sadly taken away from us on an untimely death. Shortly after taking off the plane carrying Donald Wilkinson and his fellow comrades struck a fog covered mountain. Today, Sgt. Wilkinson is remember by his family, friends, veterans and by his distinct military service. As a radio operator Sgt. Wilkinson expanded the range and performance of military radios. He was recognized and awarded several medals of Valor to include: the Navy and Marine Accommodation Medal, Vietnamese Cross of Gallantry, Combat Action Ribbon, Presidential Unit Citation and the Navy Unit Citation. Today, we continue to honor Sgt. Wilkinson and his legacy carries on. Many of us will think, remember and feel his presence every time we cross the Wilkinson Bridge. 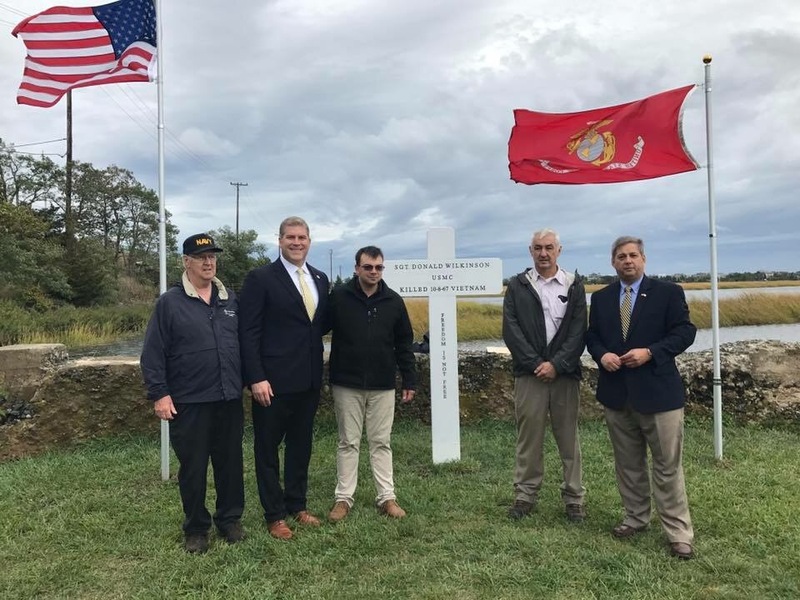 Given the similarities between the characteristics of this bridge and a United States Marine it is a fitting tribute to the strength and character of Sgt. Donald Wilkinson. Our liberties and values stand safe today because of the brave men and women like Sgt. Wilkinson who have stood ready to defend our nation. We thank God for each and every one of them. When you lay your head down on your pillow tonight, thank God for the freedom you all enjoy and ask for God’s protection on all those serving our great country this very day; all across the world. Thank you to everyone who has, is, and will be serving in our military. May God Bless You and May God Bless the United States of America. The ceremony was well attended by friend, families, members of the community and fellow veterans.